We’ve been very business-focused in our StraightTalk so far—and intentionally so. But a business architect always has a foot in two different worlds: one as part of the business and the other as part of the enterprise architecture team. Enterprise Architecture = Business Architecture + IT Architecture (where IT Architecture = Application Architecture + Data Architecture + Technical Architecture). So, for the next two posts, we are going to focus on how business architecture relates to IT architecture, and we’ll see how these two really are BFF (Best Friends Forever). Business architecture provides the business context and direction, and IT architecture makes it real through automated solutions. But wait, there’s more. We’re introducing guest stars on StraightTalk! From time to time, we’ll be joined by some experts who will StraightTalk with us on their areas of expertise to broaden our perspective. We are starting with Mike Rosen, a highly respected industry leader who has served in many different architecture and leadership roles. Here in Post No. 14, Mike gives us the straight talk on business and enterprise architecture. This post is based on our recent interview with him. Disclaimer: we’ve made some tiny adjustments for our typical StraightTalk-style: the gray headings represent StraightTalk asking the questions and our guest, Mike, responds in turn. 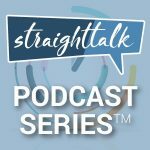 Make sure to check out StraightTalk podcast 5-Minutes With Mike Rosen. Mike: Fundamentally architecture is a representation of concepts and relationships in a context. For enterprise architecture, the context is the entire enterprise. Then to get our head around the big picture, we break the enterprise into domains like business, information, application, and technology. P.S. Those are the traditional domains but Mike usually adds performance, security, service, and integration, which are new concepts required for digital enterprises. Since we’re all about business architecture here at StraightTalk, how does it fit within enterprise architecture? Mike: Business architecture is a critical aspect of enterprise architecture because it formalizes the enterprise strategy and goals, and translates them into specific business concepts such as capabilities, value streams, information and so on—and then these concepts can be mapped down to other IT-related concepts like system applications and infrastructure. P.S. You know we like diagrams. Here’s a good one showing business architecture within the context of the other enterprise architecture domains. Just because we know it’s on some people’s minds, what are some of the popular enterprise architecture frameworks out there that are used? Mike: The popular frameworks haven’t really changed much in the last decade, like TOGAF (The Open Group Architecture Framework), DoDAF (Department of Defense Architecture Framework) and the Zachman Framework. But that’s really the wrong question to ask. Mike: We should be asking how architecture teams are influencing decision makers with architecture, not how they are building deliverables that may or may not be relevant. Creating architecture delivers no value—the value is only realized when architecture is used to influence decision-makers. Agree. When people use those enterprise architecture frameworks, how do they integrate with the business architecture framework, which is, of course, the BIZBOK® Guide? Mike: All of the enterprise architecture frameworks address business architecture as a domain. But most were developed before business architecture matured to the point it is at today. The BIZBOK® Guide provides guidance on business architecture that can be easily integrated into other frameworks and approaches. And because the BIZBOK® Guide is principle-based, it focuses more on achieving results than on a specific structure. And great news, the Business Architecture Guild® is working closely with the Open Group to integrate BIZBOK® Guide concepts and principles into future versions of TOGAF. How do the various types of architects work together? Mike: Typically architects focus on their domain and then work together through some sort of formal review board structure or a less formal community of practice to make sure that what they are doing fits together. Hot topic, but we have to ask. Is there a separate role for an enterprise architect and if so, how does that role interact with other business and IT architects? Mike: Business architects often report through a business unit rather than IT. That’s a really good structure, but when that is the case it’s important to understand how we align them. Really successful architecture follows the principle of “think globally act locally.” So, the enterprise architect is responsible for the global view and how all of the pieces fit together. Business architects have the business perspective of capabilities, value streams and so on, and IT architects have the perspective of applications, infrastructure and security—and then hopefully they all have a shared perspective on the information. So, within the local context of an initiative or project all of the architects work together to bridge the tactical concerns of the project and the strategic concerns of the architecture. Mike: Well, it’s really fake news that doing architecture takes longer. When architecture is done right, projects that use it are more successful, more evolvable, closer to on-time and on-budget, and have fewer issues. And the enterprise builds reusable assets instead of redundant liabilities. Unfortunately, the idea that architecture makes things take a long time is a stereotype that we need to overcome. You know we love six-word memoirs. If enterprise architecture were to have a six-word memoir, what would it be? Mike: Architecture’s value is influencing decision makers. 5-Minutes With Mike Rosen (StraightTalk podcast): Just in case you missed the link in the beginning of this post, you can listen to the podcast with Mike Rosen on understanding business and enterprise architecture, which was the basis for this post. Business Architecture: Putting “Business” into Enterprise Architecture (CIO Review article by William Ulrich and Richard Soley): A concise piece on why business architecture is an essential component of enterprise architecture. Enterprise Architecture Definitions (FEAPO): Important stuff here. These are the official definitions for enterprise, business, application, data and technical architecture, ratified by all FEAPO (Federation of Enterprise Architecture Professional Organizations) members, which together represent a very large number of practitioners worldwide. Business Architecture and IT Architecture Alignment (Part 6 of the BIZBOK® Guide): Here’s the official word on the topic of business and IT architecture alignment. Section 6.2 has a specific focus on how to align business architecture with other enterprise architecture frameworks (requires Guild membership to download).